Mike is a very experienced freelance Steadicam owner operator working across the genres of feature film, television drama, music, commercials, short films and broadcast productions. He began his Features career working with Brian Tufano on ‘I could never be your woman’ and went on to work on two further movies with him. Mike’s feature and drama credits include Calvary, The Awakening, Ripper Street, Stan lee’s Lucky man, The Royals and Shetland. Mike blended the worlds of Drama and live TV by being part of the award winning camera crew for ITV’s 2 ½ hour production “The Sound of Music Live” He is firmly grounded in the skills of Multicamera production having spent his early years working at London Weekend Television. In addition, when time permits, Mike also teaches Steadicam operating skills both on a one to one basis and with clients including Tiffen the manufacturers of the genuine Steadicam range. 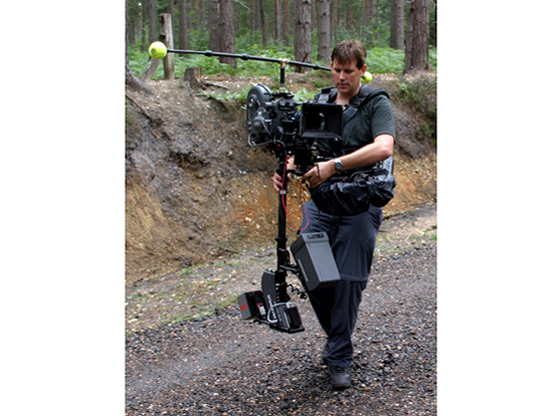 Mike is able to offer dry hire of a wide range of genuine Steadicam equipment to suit all requirements and budgets; Steadicam Ultra 2, Steadicam Ultra 1, MK3.